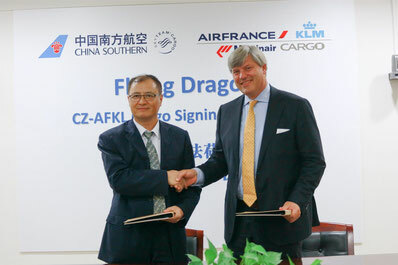 On October 11, China Southern Cargo (CZ) and AFKLMP Cargo signed a new MoU which is aimed at further strengthening the present strategic cargo cooperation which was initiated in September 2015 between the carriers. The statement issued says that the new MoU lays out the joint plans for the coming four years to jointly investigate and exploit opportunities in the air cargo market. In order to achieve this the carriers have agreed to expand existing cooperation and mutual experience to connect their business in China, Europe and beyond. Furthermore, the aim is to combine CZ and AFKLMP main deck and belly cargo networks in order to achieve higher frequencies at their various hubs in Europe and the Far East. Other aspects are to look at increasing mail and express opportunities, easier access to each other’s capacity and connection of CZ’s strong China and Asia Pacific region with AFKLMP’s equally strong position in Europe, Africa and North America. The MoU was jointly signed by Zhao Fengsheng, Senior Vice President China Southern Cargo and Marcel de Nooijer, Executive Vice President AFKLMP Cargo. Emirates SkyCargo and Cargolux have followed up on their strategic operational partnership agreement which was signed in May of this year by announcing that they will enter into an official codeshare partnership on their cargo routes. The deal which was signed in Dubai on October 10th by EK’s Senior Vice President Cargo, Nabil Sultan and CV’s President & CEO, Richard Forson, means that both airlines will now be able to procure capacity on each other’s flights and offer it to their clients under their individual air waybills and flight numbers. The codeshare agreement also applies for cargo capacity on EK’s worldwide passenger network. The strategic partnership which got under way soon after signing in May, has it seems proven to be a good move for both carriers. 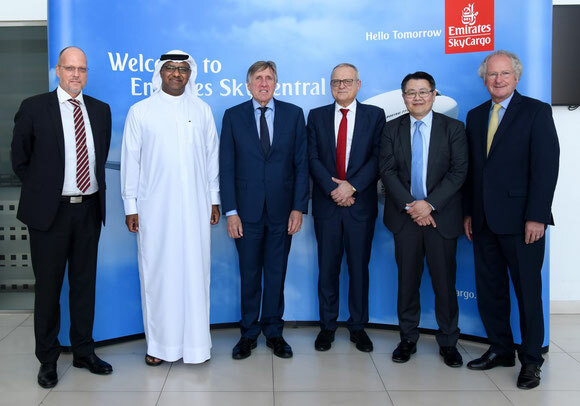 EK commenced weekly freighter services to Luxembourg in June and CV moved their complete cargo handling in Dubai World Central over to Emirates SkyCargo in July. Could this mean that Atlas will also seriously consider adding converted Airbus A330 aircraft to their fleet? They presently operate a total of 78 aircraft of which 22 are mixed B767F variants and also have a further five B767-300ER aircraft presently being converted to freighters. They will certainly need to increase this type of aircraft into their fleet if the agreement with Amazon’s Prime Air is to be extended further. Moscow based Aviastar-Tu has appointed Hong Kong’s largest handling agent, Hactl, to handle their new freighter service from eastern Russia to Hong Kong. Aviastar-Tu has initiated freighter services from the eastern Russian city of Tolmachevo to Hong Kong with their Tupolev Tu-204C freighter. Services on the route will gradually increase to four weekly flight, each of which can carry up to 28.5 tons of cargo. A further twice-weekly operation is planned from Vladivostok to Hong Kong. All flights are being operated on behalf of the Russian Post. Germanys Fraport continues to show good results with September figures being above those of last year. This brings Fraport’s first nine-months performance also above the same period of last year. For the first time Fraport exceeded the 6 million passenger mark in September by registering 6.2 million passengers traveling through Frankfurt Airport. Cargo figures also continued their upward trend. In September cargo and mail tonnage rose by 4.1% to 187,708 tons. Cargo tonnage for the first nine-months of this year has now reached 1.7 million tons, an increase of 4.7% over the same period 2016. 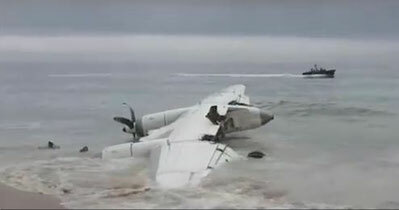 An AN-26 freighter crashed into the sea upon arrival at the airport of Abidjan, killing four and injuring six. The aircraft had been chartered by the French military as part of their operations in Africa. On board the freighter were three French soldiers, a French crewmember and six crewmembers from the Republic of Moldova. The four killed are all Moldavians. Officials didn’t provide information on the cause of the ac-cident which happened during a hefty storm and heavy rainfall. "We saw the plane flying in a circle and then heard a loud bang when it hit the water surface," a wit-ness told the agencies. Helpers organized the rescue of the victims and the survi-vors, as the spokesman for the rescue team, Oumar Diakité, said. France has de-ployed some 4,000 soldiers in West African states as part of their anti-terrorist opera-tion. Moscow-based carrier, Aviastar-Tu has appointed Hong Kong Air Cargo Termi-nals Limited (Hactl) to handle its new freighter services from eastern Russia to Hong Kong. The Russian cargo carrier has started freighter services from Tolmachevo to Hong Kong, utilising a Tu-204C freighter with 28,500kg payload and 14 pallet positions. It plans to increase services to four-times-weekly by the end of 2017: adding an extra frequency from Tolmachevo, and twice weekly flights from Vladivostok. All services are being operated for Russian Post. Launched in 2000, Aviastar-Tu has operated the Tu-204C for a number of major express parcels companies and postal authorities, both in Europe and between Asia and Russia. Kalitta Charters II has received their maiden Boeing 737-300 freighter. The airline’s mother company, Kalitta Air operates a fleet of long-haul B747 and B767 freighters and Kalitta Charters II now has one B737-300F, three B737-400Fs, six B727Fs and three DC-9Fs - all of which are used for short-haul charter work. UPS Airlines has received their first Boeing 747-8 freighter. The aircraft was delivered to UPS’s Louisville International Airport hub. UPS has a total of 14 of the type on order. China’s SF Airlines has acquired another B757-200 aircraft from Aircastle Leasing. The ex-American Airlines plane will be converted to a 757-200F by Precision Aircraft Solutions.